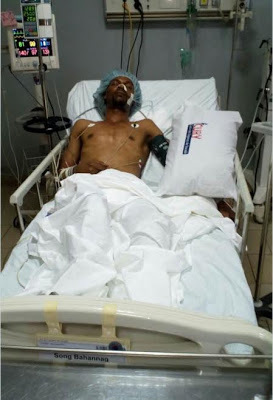 Shocking and heart breaking photos have emerged showing former Liverpool, West Ham and Cameroon player Rigobert Song in intensive care in Yaounde, Cameroon after suffering a stroke attack on Sunday. The 40 year old player, who is the uncle of former Arsenal and Barcelona star Alex Song was on Monday evening flown to France via a private jet after Cameroon’s government agreed to pay about $78,000 for his treatment in France. This is so sad! Wish him the safest and quickest of recoveries.